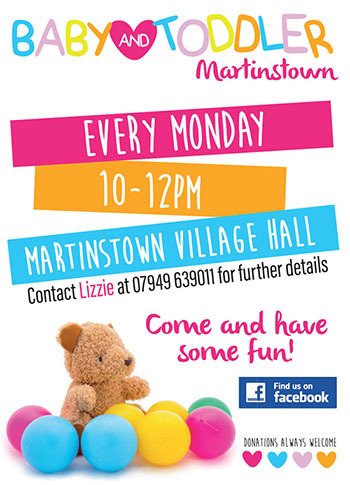 We are a friendly and local group operating every Monday (10-12) at Martinstown Village hall where we will be offering arts & crafts, song time & have plenty of toys to keep your little ones occupied. We also offer healthy snacks for the children & refreshments for the grownups. Our fee is only £2 for families with no additional fee for extra children. We are really excited to be up and running again & look forward to seeing you all there. The Valley Club was formed in 2005 and is managed by a Committee which consists of a Chairman, Vice Chairman, Secretary, Treasurer and several additional Committee members. The Committee meets about four times a year to discuss and arrange future events. We currently have a membership of around 50 and membership costs £7 per year. We aim to appeal to a wide range of interests and have presentations from a variety of speakers during the year which take place on the third Monday evening of the month in Martinstown Village Hall. We also arrange outings and visits to houses, gardens and interesting locations in Dorset and further afield. Our AGM takes place in March when we produce a leaflet giving details of all the events taking place during the following year. The Valley Club is also a Corporate Member of ‘The Gardens Group’ which entitles us to an annual visit to Poundbury Garden Centre, usually in early April, where we receive 25% off all purchases. 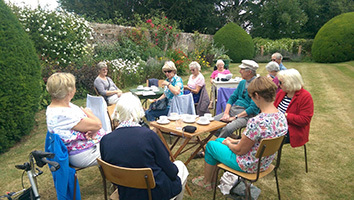 As part of the membership we also receive a free gardening talk from one of the Gardening Group experts and discount vouchers to use at the Garden Centre. We always welcome new members and non-members are also welcome to attend our presentations in the Village Hall at a cost of £3. Non-members are encouraged to join us on our trips and excursions too. We are always looking for new ideas so if you would like to join our Committee please get in touch. The Martinstown Botanical Art Group was formed in September 2006. We are a friendly group with varying standards in art and come from a wide area of Dorset. 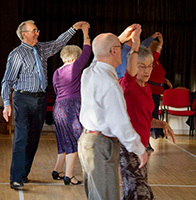 The aim of the group is to improve our skills and build confidence in a relaxed atmosphere. We have experienced and qualified tutors who give us advice and guidance covering watercolour, acrylic, gouache etc. We welcome any newcomer and whatever your painting experience you are welcome to check us out for a morning, any Tuesday. This is a purely social, non-competitive Badminton club. Both beginners and those with more experience are welcome to join us. There is one court and we play doubles and contend with the somewhat low ceiling in a generous and friendly way! All welcome. 4EverPilates gently restores natural, normal movement and posture. It strengthens the postural muscles that stabilise the torso. By correcting muscle imbalances, the body becomes re-aligned. Healthier & Happier, 4Ever! Add up the years and we may not be as nimble as of days gone by, but we are a happy bunch who turn up regularly to exercise on the chair and then around the chair to move and loosen every part of our bodies. We work quite hard but always with the full instruction of our very able instructor Suzanne. She not only shows us how to do the exercises properly but always tells us the reason why. We have fun and do feel better for it – why don't you come and join us? We are a friendly group from all over the county with painting experience which ranges from complete beginner to semi-professional. We work in a variety of mediums according to personal preference. There is no formal tuition but plenty of encouragement & advice given in a friendly relaxed manner. We have regular workshops & demonstrations by local artists. £10.00 Annual membership + £2.50 per session. Refreshments are provided. New members always welcome. One free taster session. 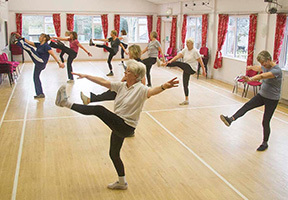 Our Friday morning class is friendly, fun and has the benefit of being good for our health and fitness. Suzanne is an excellent instructor who encourages everyone to listen to their own bodies and go at their own pace. She makes sure we work as hard as we can and always checks that we are performing our fitness moves in the correct way, so we do not injure ourselves and and so that we get the best from the class. We are very sociable and always have a laugh – so why not join us? Eyes Down for Bingo! Fortnightly bingo on Fridays. Good prizes up for grabs! Money Snowball increasing every bingo until won. Come along and enjoy a friendly evening out with friends and neighbours. Tea and coffee in the half time interval. There is a very successful and varied Artsreach programme running throughout the year. Events range from plays to children’s workshops and music nights. For further details of forthcoming events contact Fran Taylor 01305 889963 or Jan Griffiths 01305 889738. This is the village theatrical group which always welcomes new members, from the very young to the more mature. 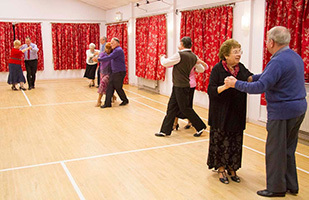 They entertain the villagers with pantomime, murder mystery dinner plays and comedies. They can be hired to perform a murder mystery as a fund-raiser for groups. If you are interested in becoming a ‘player’, no fee is required, just contact Jane or Vince Jones 01305 889202 or Fran Taylor 01305 889963. All are very welcome to our monthly Community Lunches in the Village Hall which are mostly held on the first Friday of the month. To book, please ‘phone Ced on 889438. We are always pleased to hear from people who’d like to be involved in any way, from cooking to laying tables. Please contact Jan on 889738 if you’d like to be involved – we do enjoy ourselves as well as work! This is held in the Hall in September and Lent Lunches are held during the Lent period. Jumble Sales, Craft Fairs and Antique Fairs occur throughout the year. 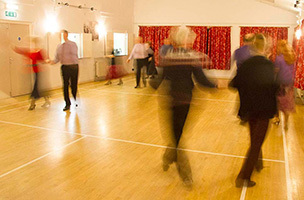 The Hall is also available for weddings, birthday parties, christenings, barn dances etc.